Valentino’s triumph also gave rise to the cocktail. Its exact origin is unknown, but the recipe first appeared in Harry Craddock’s Savoy Cocktail Book (1930). The inspiration carries over to the ingredients, with orange juice representing the sand and the rich red of Cherry Heering serving as sanguinary element. Springing for a bottle of this extraordinarily flavorful brandy has allowed me at last to make this drink at home. 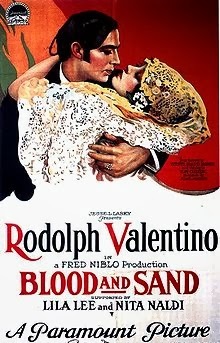 The Blood and Sand was initially an equally parts cocktail, and many bartenders still prepare it this way; A.J. Rathbun in Dark Spirits cleverly suggests making it as a punch. The redoubtable gaz regan ups the OJ ante and serves it as a brunch highball. I prefer it with an emphasis on the whisky, leading to the question of which brand to use. You’ll want a light single-malt or a blended. Famous Grouse is the default choice at the bars where I regularly order it, but following a run on the product at my local liquor store I sent Bank Note Blended (containing a higher than usual 40% single malt yet at a price that won’t gore you) into the ring in its suit of lights and it brought the crowd to its feet waving white handkerchiefs. A sterling replacement.